The following is a partial list of recent activities in which MAST has played either a supportive or a lead role. More information about some of these programs can be found using the menu to the right. These programs were developed to help meet MAST’s goal to increase use and availability of local and regional transportation options in the Monadnock Region. Rack it Up! aims to increase both the number a nd visibility of bike racks in Monadnock Region communities in order to promote bicycling as a viable form of transportation. The program began in 2014 when MAST received a grant from the N.H. Charitable Foundation to seek business partners and others to participate in a 50% cost-sharing program to purchase bicycle racks. This first phase of the program resulted in 90 new bicycle parking spaces throughout the City of Keene. In 2015, the program expanded thanks to funding from Healthy Monadnock and the Centers for Disease Control and Prevention (CDC) to include more communities. In addition, the program now covers 100% of bicycle rack costs. 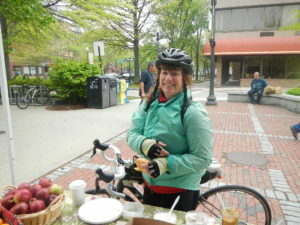 A bicyclist stops by Railroad Square for free breakfast on Bike to Work Day in 2016. Walking and bicycling tours of Keene that highlighted examples of pedestrian- and bicycle-friendly street design. In 2016, a subcommittee of MAST was formed to oversee the development of a background report about carsharing in the Monadnock Region. Carsharing is a transportation option that offers the benefits of having access to a car without the cost or obligations associated with private ownership. MAST enlisted the help of a student from Keene State College to conduct research on carsharing. The report that was produced, called Carsharing: An Alternative to Private Vehicle Ownership, can be accessed on the MAST Documents page. MAST plans to continue looking into the feasibility of carsharing in the Monadnock Region in 2017. To learn more, please see our post about carsharing. Southwest Region Planning Commission (SWRPC), has partnered with Healthy Monadnock to participate in a program of the CDC called “Partnerships to Improve Community Health” (PICH). This 3-year initiative funds a multi-sector coalition in Cheshire County that is working to address the leading risk factors for the causes of death and disability in the US: lack of physical activity, poor nutrition, and tobacco use. SWRPC was subcontracted by Cheshire Medical Center/Dartmouth-Hitchcock Keene to work with MAST to undertake the active transportation component of this initiative, which includes promoting Complete Streets, working with schools to develop Safe Routes to School action plans, and continuing the already successful “Rack it Up!” program. Complete streets are streets that are designed, constructed, and maintained for everyone. They enable safe access for all users, including pedestrians, bicyclists, motorists, and transit users, regardless of their age or ability. A complete streets policy ensures that transportation agencies routinely design and operate the entire right-of-way using a complete streets approach. The creation and implementation of Complete Streets policies directly addresses the first two objectives of MAST’s 2012-2020 Action Plan, to “Expand Use & Availability of Sidewalks & Walkways” and “Increase Use & Availability of Bicycle Infrastructure.” To learn more, visit our page about Complete Streets. Safe Routes to School (SRTS) is a movement to encourage students, including those with disabilities, to safely walk, ride bicycles, or use other forms of active transportation to and from school. SRTS aims to improve safety for children who walk or bike to school, decrease rates of childhood obesity and related diseases, and ease traffic congestion and improve air quality near schools. More and more people are turning to their computers, mobile devices, and tablets for information related to transportation and wayfinding. To increase the availability of public transportation stop, schedule, and fare information to this audience, SWRPC worked with City Express to create this information in a digital format used by hundreds of other agencies. Today, riders with internet access can visit www.google.com/maps to quickly plan a trip that includes biking, walking, and City Express.